The Los Angeles County Museum of Art (LACMA) exhibited Abdulnasser Gharem: Pause, marking the first solo presentation by the artist in the U.S. 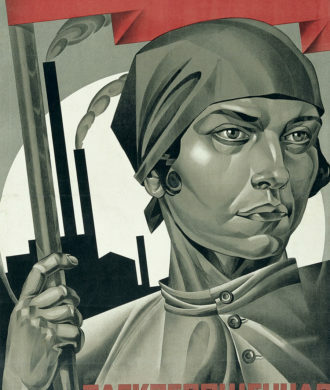 The exhibition, which was curated by Linda Komaroff, head of Art of the Middle East department and curator of Islamic Art at LACMA, included 11 remarkable works of sculpture, stamp paintings, prints, and film—all of which were created in the aftermath of the tragic events of September 11, 2001. For Gharem, seeing the World Trade Centre destroyed on television was a horrific moment that seemed to make the world stand still or pause; he learned soon after that two of the hijackers were former classmates. The fact that Gharem is a Muslim, an Arab, and a Lieutenant Colonel in the Saudi Arabian army added resonance to the American audience while serving as a reminder that terrorism is experienced on a global scale. Gharem deeply absorbs the notion of pause into his work as an occasion to examine certain universal dichotomies that lead one to choose his or her path in life. Although the mediums and platforms for his work clearly borrow from the mainstreams of modern art, the narratives and images are drawn from the artist’s everyday world while many of his motifs, including geometric designs and floral arabesques, belong to the canon of Islamic art. “Abdulnasser Gharem belongs to a pioneering generation in Saudi Arabia that has introduced a local arts community to the global discourse. 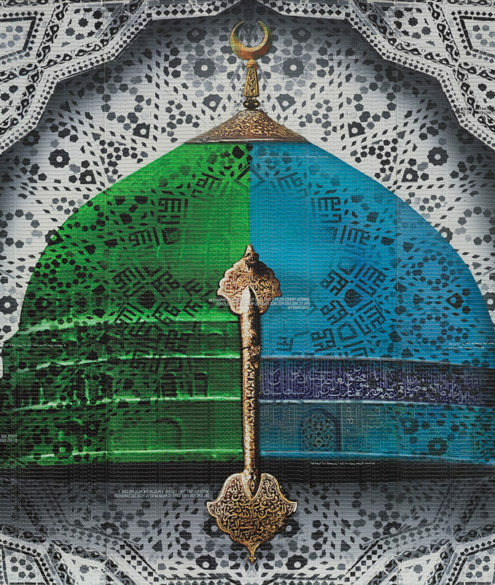 Gharem is at the forefront of this movement, creating art in a range of mediums and techniques largely outside the traditions of painting, drawing, photography, and sculpture.” says Komaroff. Gharem frequently uses Islamic architectural settings in his work. 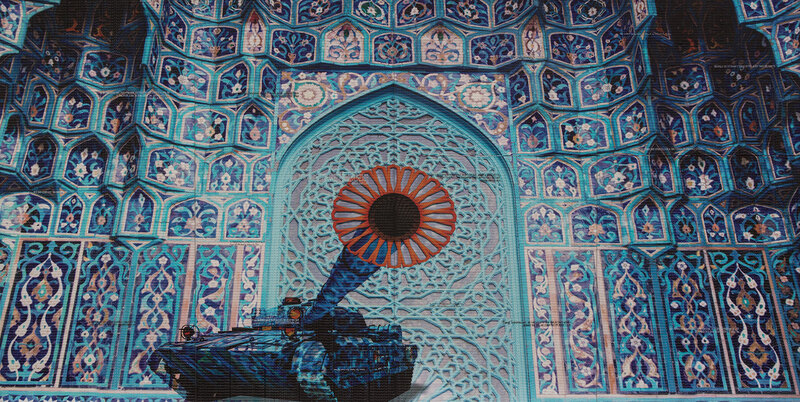 With Camouflage, he employs an Iranian mosque as the backdrop for this monumental “stamp painting,” which depicts an army tank with a giant orange daisy protruding from its cannon. The flower and the colourful tile decoration of the mosque façade belies and even disguises the deadly nature of the armoured vehicle. 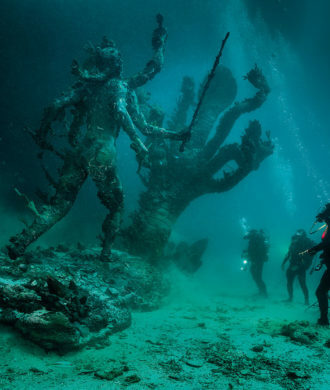 For the artist, this form of camouflage represents his own critique of theocracies that prey on sincere religious beliefs by promoting a message of intolerance towards adherents of other faiths. For an American audience, the combination of weapon and flower may be reminiscent of some of the anti-war imagery from the Vietnam War era; this powerful work perhaps takes on a new meaning once transplanted to U.S. soil. Like many contemporary artists, Gharem often uses mundane everyday elements to form penetrating appraisals of modern society. 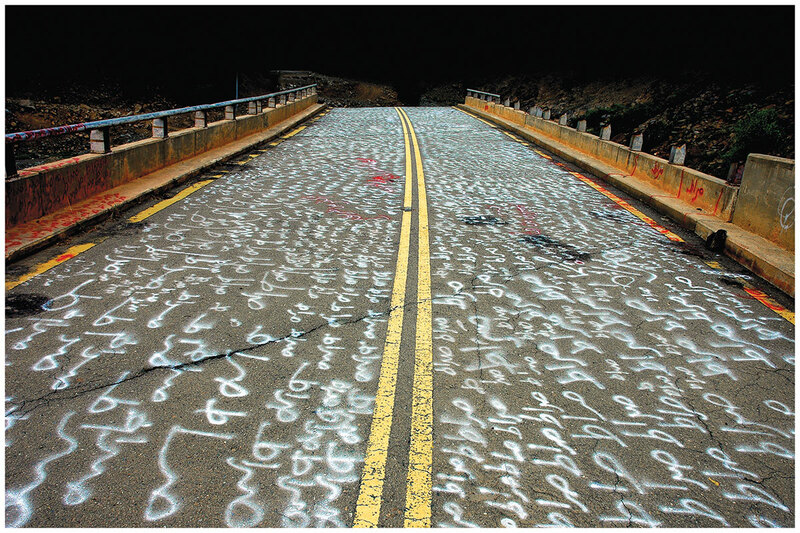 In Road to Makkah, he transforms a standard sign found on the road to Mecca into one of his iconic “stamp paintings,” the surface of which is composed of small rubber stamps. As the birthplace of the Prophet Mohammad, the site of the Ka’bah (the directional locus of Muslim prayer), and the endpoint of Hajj, the annual Muslim pilgrimage, the city of Mecca is one of the holiest spaces in Islam. 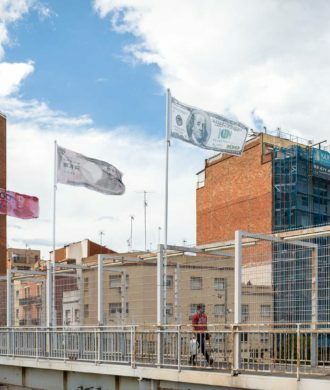 This sign directs Muslims straight ahead into the city, while non-Muslims are sent to the right and those involved in the official business are sent to the left. Embedded within the larger text of the sign are smaller quotes made from the rubber stamps and therefore seen in reverse. The quotes refer to the unity, peacefulness, and sanctity of the city, perhaps included by Gharem as a subtle critique of the practice of exclusivity. 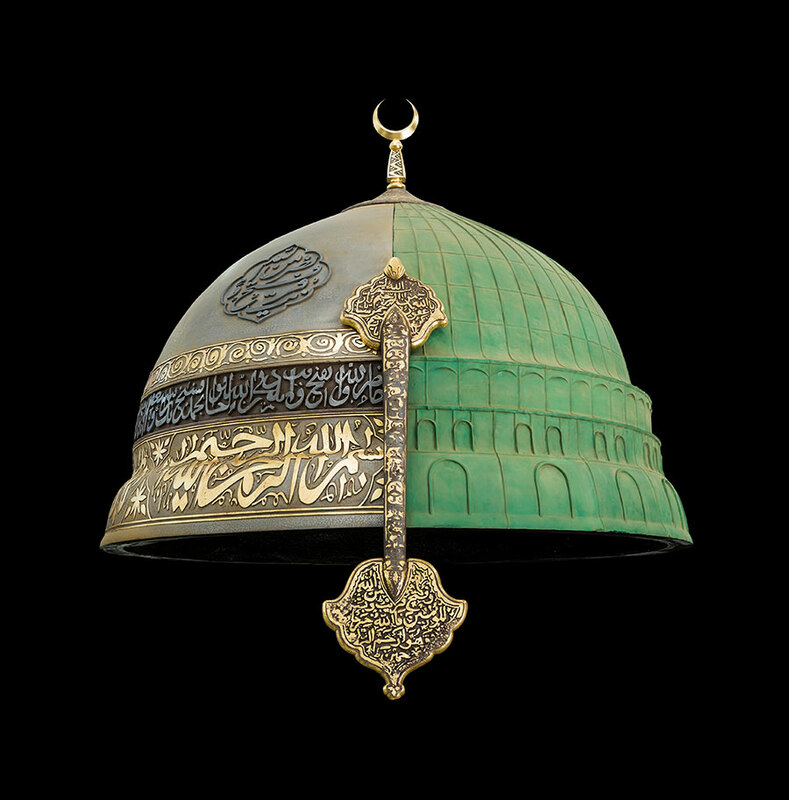 Gharem has produced other dome sculptures, but this work, his most recent version, presents an amalgam of two distinct forms to create the cupola: a mosque’s dome and a Persian warrior’s helmet. The title of the work is intended to suggest two halves that form a whole, as in the human brain with its left and right hemispheres, the former governing logic and the latter creativity. 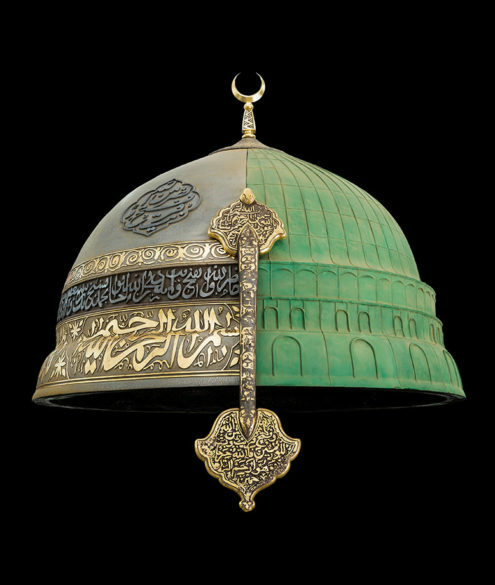 In the sculpture, the right half is based on the distinctive green dome of the Mosque of the Prophet in Medina, Saudi Arabia, which is the second holiest site in Islam, after the Ka’bah in Mecca. Expanded many times over, the mosque’s dome was constructed in the early 19th century. The left side of the sculpture is patterned on an Iranian helmet inscribed with verses from the Qur’an, dating to the 18th or 19th century, and probably intended for ceremonial and parade wear rather than for actual battle. The two halves of the dome are separated by an appropriately enlarged and inscribed nasal piece—the projecting bar on a helmet covering the nose and protecting the centre of the face. 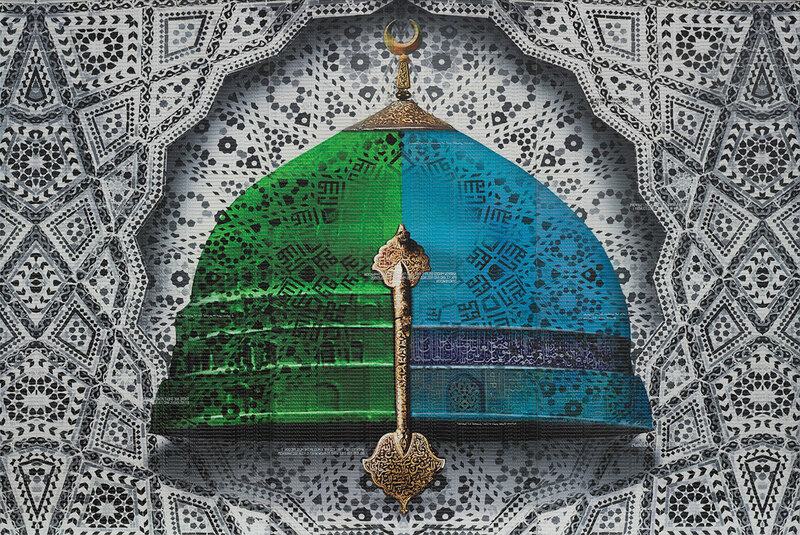 The co-mingling of the dome and the helmet in a single sculpture alludes to the dichotomy inherent in most faiths – a message of peace and supplication versus the types of political and sectarian concerns that sometimes lead to violence. Abdulnasser Gharem was born in 1973 in the Saudi Arabian city of Khamis Mushait, where he continues to live and work. Gharem’s vocational path embraces the polarities of artist and soldier. Although he has had no formal art training, as a commissioned officer he found time to study on his own – learning about 20th century art through the internet – and to form a cooperative venture with other artists, which in 2003 became the art collective ‘Edge of Arabia’. Co- founded by Gharem, the organisation aims to support contemporary Saudi artists and help them reach an international audience. Gharem is at the forefront of this movement. 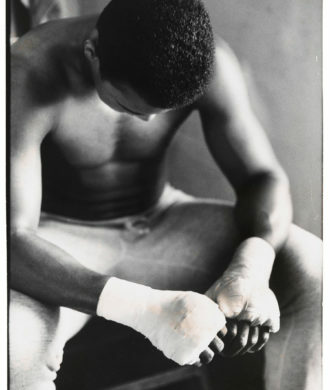 Since its inception in 1965, the Los Angeles County Museum of Art (LACMA) has been devoted to collecting works of art that span both history and geography, in addition to representing Los Angeles’s uniquely diverse population. Today, LACMA is the largest art museum in the western United States, with a collection that includes more than 130,000 objects dating from antiquity to the present, nearly encompassing the entire history of art from across the world.